Lost Samba – Chapter 01/02 – A distinguished guest. Breakfast taken, uniform checked and impeccable, Mum, Dad and sister dressed elegantly, we were all ready to leave. While the rest of the family set off by car, taking the fast route skirting the city’s beautiful beaches, I had to catch the school bus because I was the only actual student. In order to pick up the other children, the old red and yellow vehicle took the side streets zig-zagging along Copacabana’s two main arteries, Avenida Nossa Senhora de Copacabana and Avenida Barata Ribeiro. Long branches of lush trees offered shade to both avenues. Beneath them, trolley buses emitted loud and bright sparks as they passed under the web of electric wires held aloft by rusty posts. By eight o’clock, a mass of crowded public buses and bulky 1950s-style cars already jammed the avenues and the adjoining streets. Impatient drivers hooted for no reason and barefoot moleques – or street boys from the favelas – darted between the gridlocked traffic, pushing wooden carts so low they almost scraped the asphalt. In our condition of posh little gringos, we stared at these boys from the bus windows with a mixture of envy and fear. Although those moleques were about our age, if given the opportunity they could easily – and would – beat up any of us. They worked at the feiras, or open-air markets, where the stand owners hired them to fill their carts with produce and deliver them to the porters of the customers’ homes and offices. These makeshift markets changed neighbourhoods every day, and wherever they landed, they combined pungent smells of fruit, meat and fish exposed to the hot sun. Their odour and their unmistakable noise advertised their presence from many blocks away. From beside the fruit stands, powerful black men in torn shirts shouted out songs and rhymes to attract the madames: “Only today! Pretty women get a discount if they buy a half kilo!” – “Look at the fresh bananas, only 10 Cruzeiros a dozen!”. The bus progressed slowly through the streets and at the various intersections, it met with smartly uniformed mulato policemen who controlled and directed the traffic through an artful mix of whistles, glances and hand movements resembling a rare bird’s mating ritual. On that special morning of November 1968 there were to be no classes. In honour of the occasion, Union Jacks and Brazilian flags were everywhere and excitement filled the air. The cleaners had unbelievably wiped away the normal carpet of leaves and rotting fruit from the school’s huge playground. While a small crowd of guests gathered outside in the patio, a nervous buzz was building all around. We settled in our usual classroom and waited for the other classes to leave for the assembly hall where the event that the entire school had been anticipating for months was going to take place. Our teacher, Mrs Feitosa, was an assertive blonde-haired woman from Manchester in her mid-forties who had married a Brazilian. Her make-up and her elegant dress did not diminish her authority as she closed our classroom’s door and stood in front of the blackboard. We stopped whatever we were doing, fell silent and she continued. Mrs Feitosa gave us “the look” from behind her glasses and twisted her thin lips. As if by magic, each pupil thought our teacher was directing her evil eye at him or her so we were relieved when someone opened the door to say it was our turn to leave the building. Back out on the patio, there were now more parents and other adults were waiting, all dressed in their best clothes. As we passed by, they proudly waved and smiled at us, while at the same time they kept turning their heads to see if the distinguished guest had arrived. When we had almost reached the entrance, we heard sirens and Mrs Feitosa looked back. 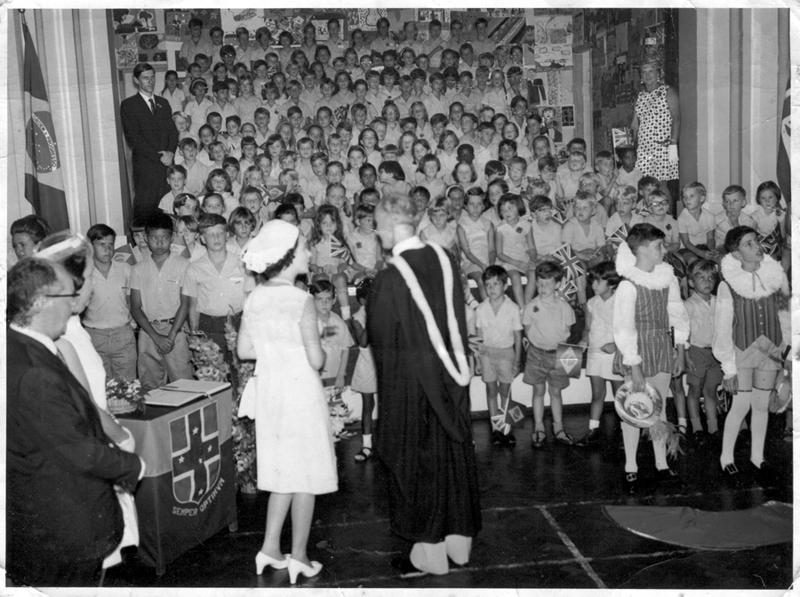 We followed her gaze and saw the great moment happening: accompanied by her entourage, Her Majesty, Queen Elizabeth the Second, was entering the British School of Rio de Janeiro. In full regal resplendence, the Queen, wearing a plain white dress and matching hat, was standing in an open-top Rolls Royce, waving and smiling at the crowd now gathered alongside the row of palm trees extending all the way from the school’s entrance gate to the playground. Moving slowly alongside were the most impressive motorcycles any of us had ever seen. As in a film, they were huge with roaring engines, enormous radio antennae and glitzy transparent protective shields. The sun was shining on the riders’ dark glasses and they looked like Hollywood stars in their leather jackets displaying the official emblem of the military police. Mrs Feitosa broke our trance by telling us to enter the assembly hall and to climb onto the stage before the security staff allowed the grown-ups into the room. We were lucky because this was the best viewing spot. When the Queen entered, all chatter stopped and as silence filled the room, it was as though the power and aura of the British Empire had transformed the entire building into an outlandish place carrying the Kingdom’s importance and pomp. Prince Phillip followed behind the Queen and he stopped to chat with, of all people, my sister Sarah, who was standing amidst the section of the hall reserved for ex-students. Sarah was amazing: confident and polite. The two students who had been chosen to take the leading roles in welcoming the Queen were English “thoroughbreds”, as everyone called that clique. Dressed in the style of traditional British aristocrats, the boy walked up to Her Majesty and in a chivalrous manner threw his cape across the floor, while the girl stood facing him. The girl then curtsied and the boy bowed, and when he rose he shouted out something or other that I did not catch. Whatever it was that he said, the Queen acknowledged her approval before turning towards my class. Mrs Feitosa lifted her hand and we began to sing. Well-rehearsed as we were, much to everyone’s relief we sounded good. After the applause, there were presentations and speeches, the Queen spoke a bit, and at the end of the ceremony the school’s staff handed out royal teacups to the guests as presents. The festivities continued long after she left. If there ever was a golden day for the British community in Rio, this was it.